The 140 patches of the Digital ColorChecker SG were chosen specifically for their location in the color space including the 24 patches of the original ColorChecker to provide common known reference colors, 17-step gray scale patches for more accurate camera balance, and 14 unique skin tone colors for more accurate and consistent colors over a wide variety of flesh tones. Furthermore, Digital ColorChecker SG targets are designed to work with Xrite's Eye-One Match and ProfileMaker 5 Digital Camera modules to produce the most accurate ICC profiles for your digital camera. Box Dimensions (LxWxH) 11.7 x 8.25 x 0.25"
Digital ColorChecker SG Card is rated 4.6 out of 5 by 8. Rated 4 out of 5 by Chin from Color After a week searching for software to go with the color checker, I finally decided to purchase pictocolor incamera (199USD). Yes, the color checker does not come with software to make color profiles. It was a shock to me as it is three times the price of colorchecker passport yet no software provided. However I still love it. I was amazed to see that compared with the color profile of colorchecker sg, the color profiles by raw convertors include those so called neutral are actually far from being accurate. Compared with color checker passport, the extra steps taken toward making color profiles make it more accurate, not to mention the 140 color patches compared with 24 color patches. It is so easy to be carried away with all the possibilities to twick color in digital photography that we lost count of what the real color really is. I do not want to be too far off. Yes, I would recommend it. Rated 4 out of 5 by Kurt from The standard The standard for creating profiles and confirming color accuracy. Two downsides there is a slight variation from chart to chart, and two patches fall just outside the bounds of AdobeRGB(1998). Rated 4 out of 5 by stweb from Best camera target I've been working on profiling my digital SLRs for a open-source RAW converter. The Digital ColorChecker SG is better than most other commercially available targets. 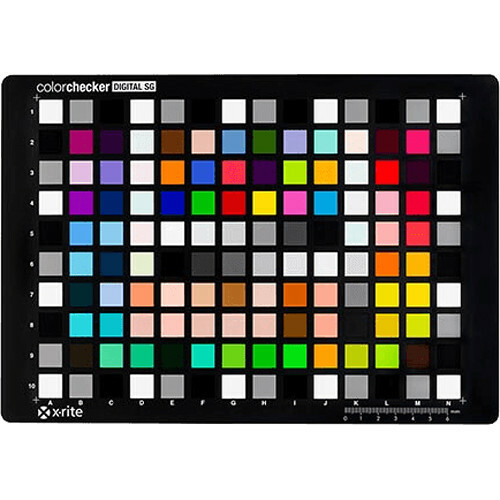 X-Rite Colorcheckers are pigment-based and have realistic spectral properties and no fluorescent brightening additives. The white patch is bright (L*=96). I only dream that the Colorchecker Digital SG had 1000 patches (and not just 140)! I was disappointed to find that X-Rite do no supply chart measurements (not even batch measured data). You can download generic data from their website, ask X-Rite support for generic data in CGATS format or get it by installing X-Rite ProfileMaker (non-functional installation good enough). Ideally, a spectrophotometer is useful for measuring the chart and the illuminant when taking photos of the chart. Rated 5 out of 5 by BMA from A must for accurate photography We use this ColorChecker for accurate reproductions at the Museum. It is essential to make custom ICC profiles for each artwork. Rated 5 out of 5 by BeeEmmZee from Keeps My Gear At The Top Of Its Game I own very expensive and top quality gear. The SG Card is one of many checks I use to insure cross color compatibilty and settings from scanners, cameras, terminals, etc. I found the card useful to maintain the very best color range settings across the equipment. Expensive...but a high color quality check. Rated 5 out of 5 by Shelley from The Gold Standard The perfect tool for custom camera profiling. I use the SG checker with inCamera software to create custom profiles for my Betterlight Digital Scanning Back. Rated 5 out of 5 by JK from An excellent tool for color management This is required for the Eye-One Match software to create camera profiles. It's a very useful tool for color management, through out the digital process. What's the advantage for this compared to Colorchecker passport? Even their software doesn't support this one. How can I use this one to get more benefits? Do I need to get a separate software? If so, which one? Is the ColorChecker SG practical for a landscape photographer to use in the field? Is there a sleeve to keep it from getting destroyed? I recommend a notebook sleeve. It should be kept out of sunlight so the colors won't change over time. Yes, it is useful. However, at longer travels, the X-rite Passport ColorChecker is more versatile. Where do I find the colour data for each patch? A quick check of the x-rite website left me empty handed. Can anyone suggest a workflow for using this product? It looks like the companion software is discontinued? Lumariver Profile Designer works well with this product as well as the Color Checker Passport. It is available in 3 offerings: the basic generates DNG fuels only, the Pro edition will generate icc profiles as well as DNG. The Reproduction edition also generates 3D LUTs. Its a very comprehensive solution.